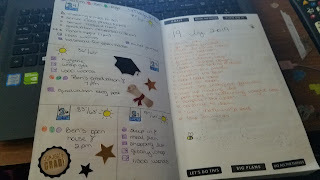 That little black book is my bullet journal. It's also been the salvation to my sanity a few times lately and I wanted to share it with all of you. 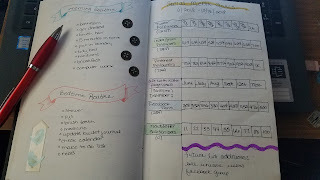 For those of you who don't know what a bullet journal is, check out this link and then come on back. Don't worry, I'll wait for you. Back? Yay! I started mine back in May. I'd heard about them but every time I saw one, it seemed so beautiful and so expensive. I saw people talking about the huge orders they'd put in, etc. I live penny to penny around here so there just wasn't the funds to invest like other people seemed to be doing. Plus, I have ocd which leads to perfectionism which leads to "omg, I'm going to mess something up and then what?!?" Somehow though, I talked myself into just going down to Walmart and picking up whatever I could find. They didn't have the fancy dotted paper notebooks so I bought an artist's sketchbook without perforated pages. 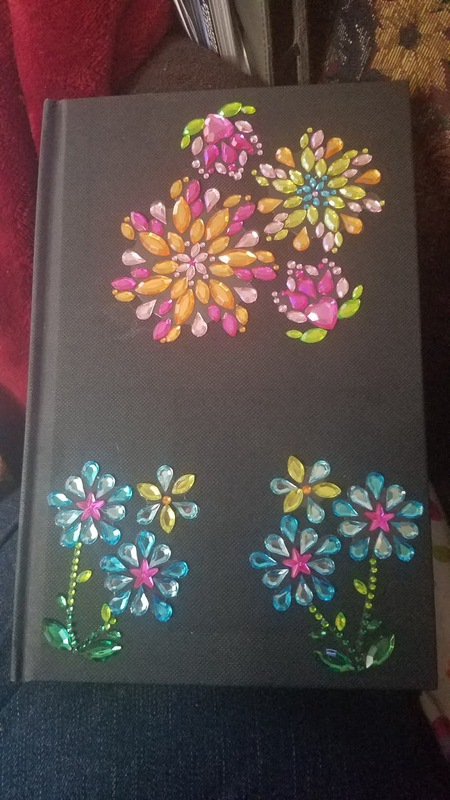 It was plain so I slapped some jeweled stickers on it and ta-da! my bullet journal was born. My first big task was to create the key. I spent a lot of time fussing over this before telling myself to just put pencil (and then pen) to paper and create it. If I hated it later, I didn't have to use it. 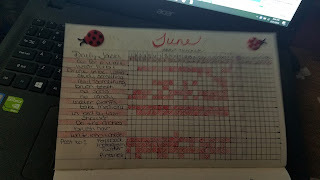 Then, I decided that I didn't really want to do a monthly calendar. I use a Google calendar and I'm very much in the habit of checking and updating that. However, there are some habits that I really want to enforce, so I created a habit tracker and then on the opposite page, a page that lists things that I should be doing quarterly. When I do them, I can add in the date to help me to keep track. 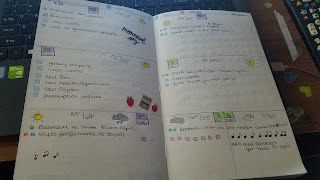 I do like the idea of a weekly layout though. It's a place that I can put all of the appointments but also add little things like...graduation stickers to celebrate my oldest's high school graduation. The 19 before 2019 is simply a list of goals that I'd like to achieve by the end of the year. I admit that it's coming along slowly and something I need to look at more often. 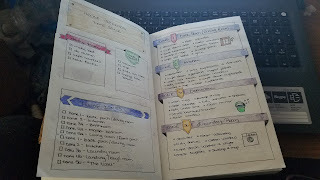 This is another one of my weekly layouts. As you can see, there is a ton of blank space. That was bugging me but I did have fun adding stickers and even starting to doodle a little bit. Some of you may know that I'm a writer. I have a series that I've been working on with Nick Davis called The Tether Saga. Right now, I'm writing the last book in that series while also working on another book. 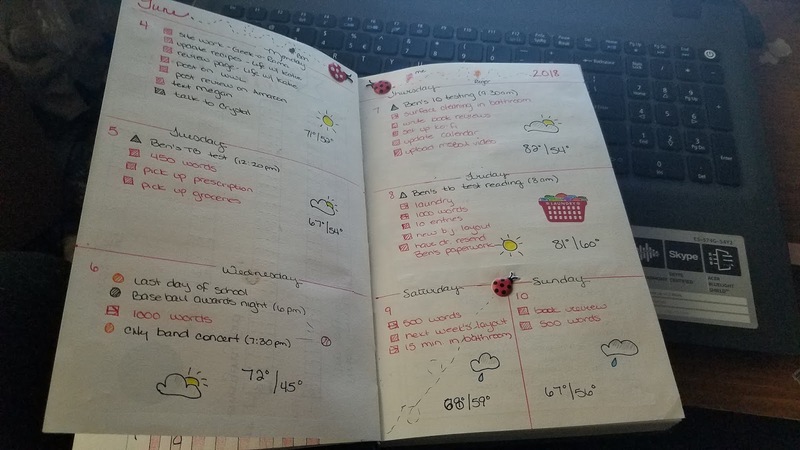 I created these pages to keep track of my progress as well as any important notes that I needed to keep track of. For June, I wanted to go with some kind of theme. I've seen some absolutely beautiful ones but I'm really not much of an artist. 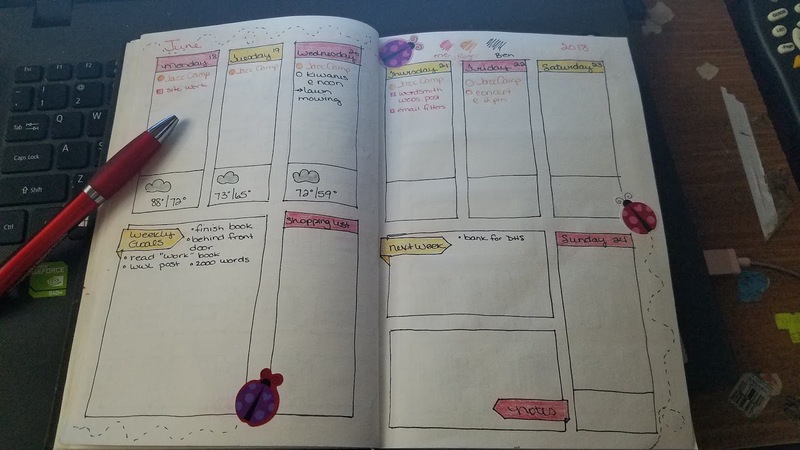 I found these ladybug stickers and decided to go with that along with a red/white/black theme. As you can see, I have some areas that I really need to work on but I'm getting better in others. I know it will take time and I'm trying to be patient with myself. Even though I have next to no income right now, I do have things that I really need/want to get. 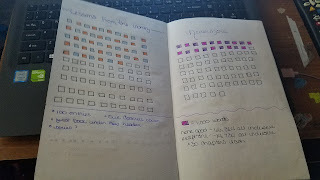 The one item that should be on here but isn't is new memory for my laptop so that I can keep posting and writing. That's $70. 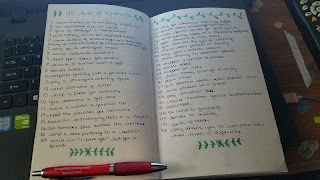 Anyway, I thought that a tracker might help keep it in front of me so that when I did have a few extra dollars (or someone donated to my Ko-Fi), I could set it aside to go towards one of these things. See my ladybugs? 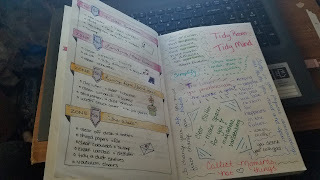 I really enjoy this theme and even tried to do a bit of doodling by adding laundry to that laundry basket. Some of you know that I have hoarding issues. I think I've written about it here. I decided what might help me to become less overwhelmed is to come up with a zone cleaning schedule that I could put into place once I'm done de-junking the house. This is the first two pages of it. This is the second page along with a page of quotes. 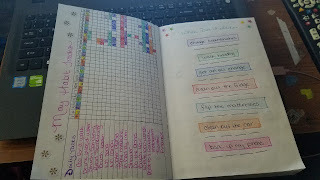 I love the fact that I did all of this by hand and even the untidiness of the quote page has started to grow on me. It was my first real challenge of just doing it without drawing it all in using a pencil first and while it's sloppy feeling, I kind of love it. 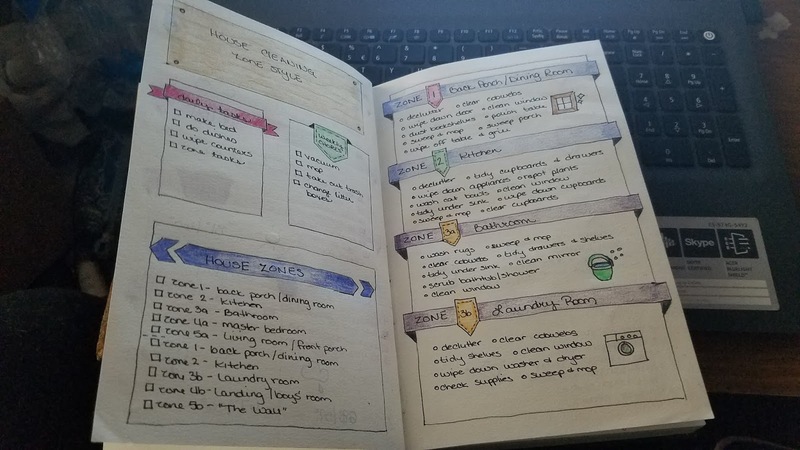 So, to be able to get to use the zone cleaning layouts, these are the tasks that have to get finished inside of the house. As you can see, it's not a small list, but I've broken it down into what I'm hoping are manageable sections. As you can see, I have a ton of outside projects that really need to happen as well. 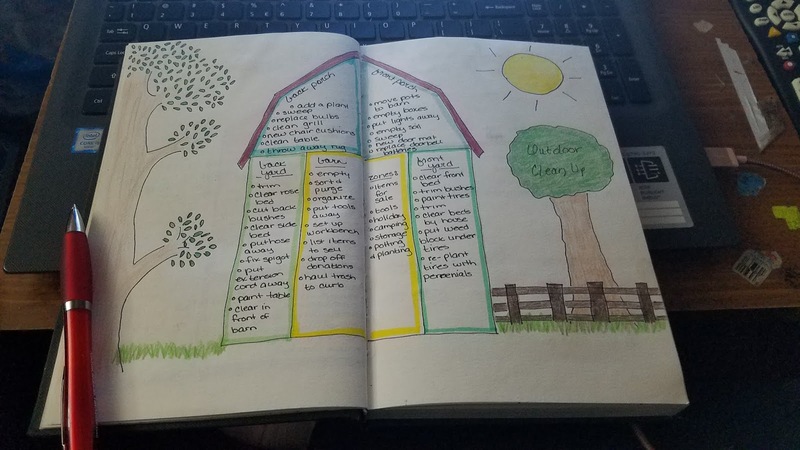 I'm hoping to find a couple of days soon where neither of my boys have to work and the weather isn't too terrible so that we can go out and tackle that barn. It's a huge one but it will also make a huge difference. Just another weekly layout. I discovered that my stickers were too puffy and it was messing with the pages so I drew these ladybugs. I think they turned out okay. Routines can be really helpful once I get into them and stick with them. Just ask me what I'm doing on Mondays and the answer is always the same. I've gotten into that habit/routine. 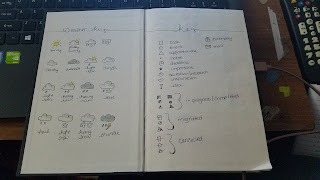 Now, I'm working on building up my morning and before bedtime routines to help find more stability. 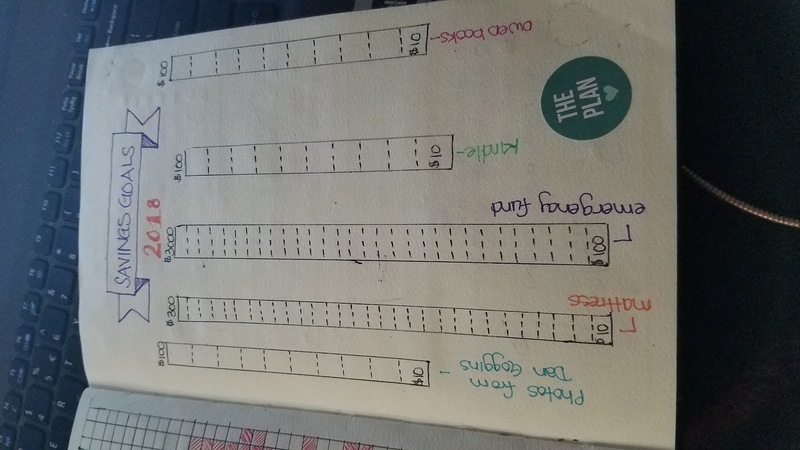 The other page is to track my social media goals. Connections are so important to me not just because as a writer, I need readers, but also because they remind me daily that I'm not alone in this world or on this journey. 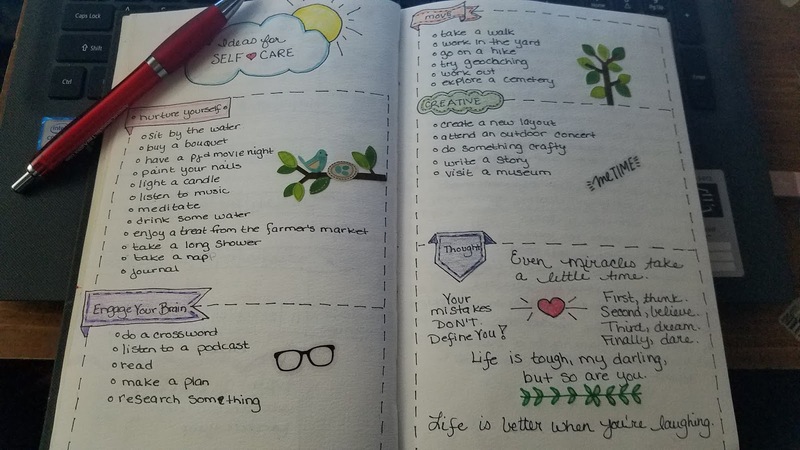 I know that we've all heard how important self-care is. I also know that when you probably need it the most is just when you can't think of a single thing. 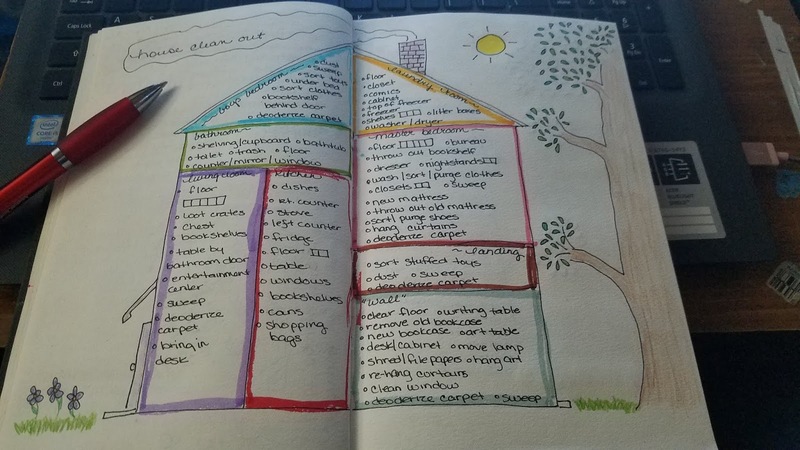 So, on a good day, I made this layout with different ideas of things that I could do. It actually came in handy today when I saw it and reminded myself that it was okay to spend some time offline and curled up with a book. At my son's graduation a few weeks ago, the keynote speaker talked about Return on Investment and how it's important not only to invest in ourselves, but perhaps, more importantly, in others. This really struck a chord with me because it's important to me to make this world a better place for those around me. It's part of the reason that I write about my own struggles. I want others to see that they aren't alone. 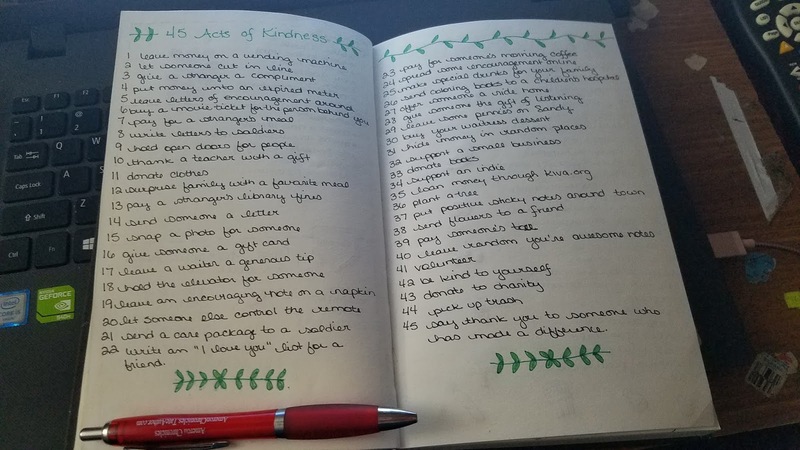 These are 45 acts of kindness that I want to complete far before I turn 45. As part of my "I really need to take better care of me" thought process, I thought it'd be good to make a list of healthier snacks. Don't get me wrong, Doritos are delicious, but they probably aren't what I should be eating on a regular basis. On the other side of this, I posted a question on Facebook asking my friends to name one movie that they think I should see. 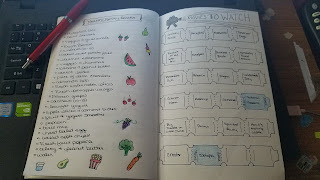 Then, I put them onto the little movie tickets and as I see each one, I'm coloring it in. Remember how I said that I felt like my other weekly layouts were leaving just too much blank space? 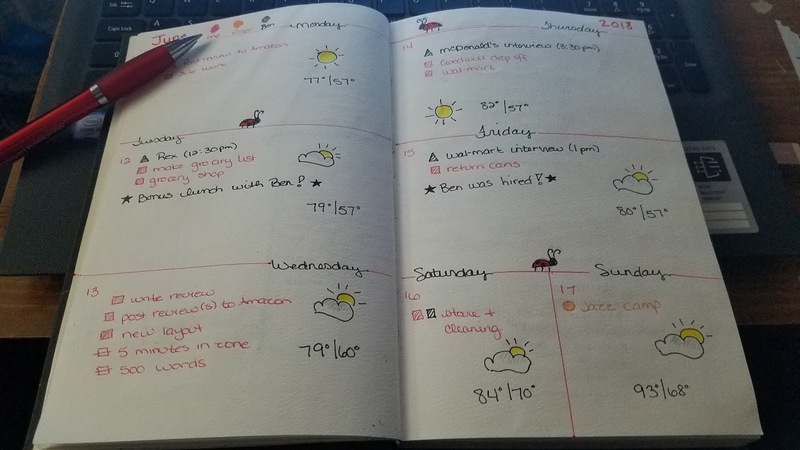 This week, I've tried this layout and I like it so much better! It gives me space to create weekly goals and to jot down notes and even things that I need to pick up at the store! I think I'm going to stick to this style for a while. I've always been told that a good writer should read as much as they write. I probably read a good bit more than I write (I need to work on that!) but I've always been a voracious reader. 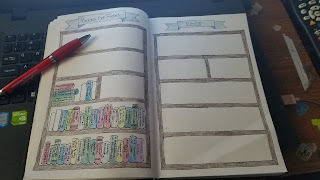 This layout gives me a chance to keep track of what I've read throughout the year. 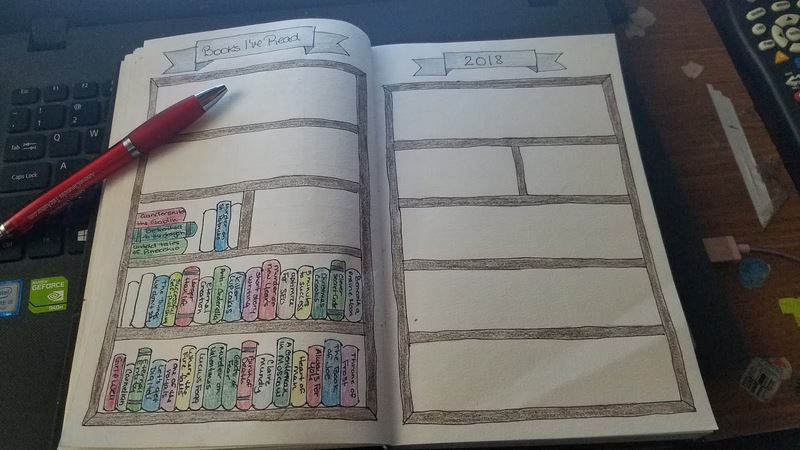 I need to add another couple of books to it and then draw in some more blank ones. 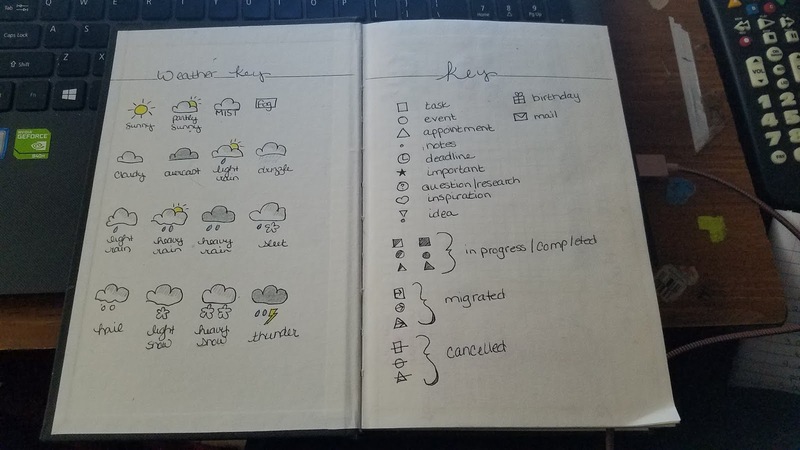 That's my bullet journal so far. I know that this is one looooong post so if you made it this far, thank you! 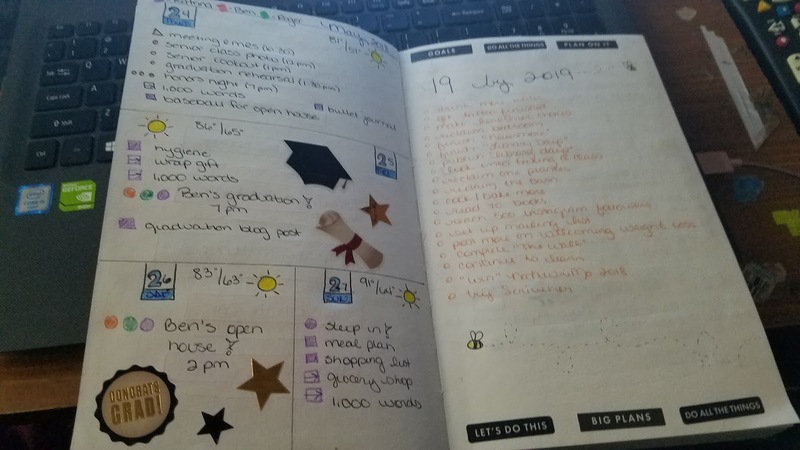 I hope that you can see the different ways that I'm using my journal to help with not just my daily life, but the bad days that sometimes come along with PTSD and Bipolar 2. I know that there will be days when I just want to give up because it feels impossible. 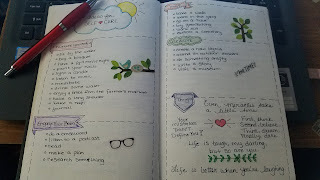 I've had one or two of those since I started working on this and when I've flipped through this book and realized that I've done this..I doodled and spent hours with a ruler and came up with this ...it's been a great reminder that if I can create this, maybe I can keep going and create something a little better for me and those around me. If you create one for yourself, please leave me a comment or track me down on Instagram, Twitter, or Facebook. I would love to hear about it and see pictures!